As they get older, people tend to find a routine that is comfortable. They’ve identified what they like and what they don’t, and primarily stick with the ideas, beliefs, people, and experiences they know and enjoy. They begin to draw a boundary around themselves and automatically reject anything new. This is when it’s easy to get caught up in living a comfortable life and forget Who you really are. You can begin living life on autopilot. But the whole point of life is to expand and grow. It’s setting your sights on something new and using the power of your desire to literally pull Source Energy to and through you to create a brand new thought, perspective, or experience that is unique to you. And as you get your bearings in this new place, you can then look around for something new to ignite a desire within you. That feeling of exhilaration is literally life-force! It’s the constructive anabolic-energy that helps our bodies heal, rebuild, and flow with physical energy. This doesn’t mean that you need to go jump out of an airplane or do something extreme, unless that is what you want to do. It’s just as effective—and for most people, actually more so—to just reach for something new that feels good. While it can feel exhilarating to jump for something that scares you silly, there is still forward momentum in continually reaching for what you enjoy. The key is just to reach. One way to reach is to be genuinely curious about life. My Step-Dad is one of the most curious people I know, and can sometimes drive me crazy asking questions that I have no answers to, but I also love how energetic, creative, and mentally agile he is. Well into his 70s, he’s also incredibly healthy, and doesn’t take a single prescription drug. Being curious opens you up to ideas, thoughts, and creativity. It is a continual voyage of discovery about life, how things work, and how they can be improved. It can also help you find new things that you love. Actively appreciating what you do have actually opens you up to discovering new things to appreciate. There are lots of ways to practice appreciation—write down lists of things you appreciate every day, or as you’re going to sleep, mentally visualize all the events of your day that you appreciate. It’s incredibly powerful to focus on what you appreciate before you even get out of bed in the morning. We’ve all heard the guidance, “Follow your bliss.” Focusing on and doing things that you love helps open you up to new things. For me, this was exemplified recently on Pinterest, a virtual pinboard where you can find, organize, and share things that you love. I discovered that I love cars—or more precisely, beautiful pictures of beautiful cars. I don’t anticipate that my identification of cars on the road will change, but it was fun to discover that I appreciate something I’ve dismissed my whole life. I already know it will give my Step-Father and me something new to appreciate together. Zip lining for the first time in Jamaica. 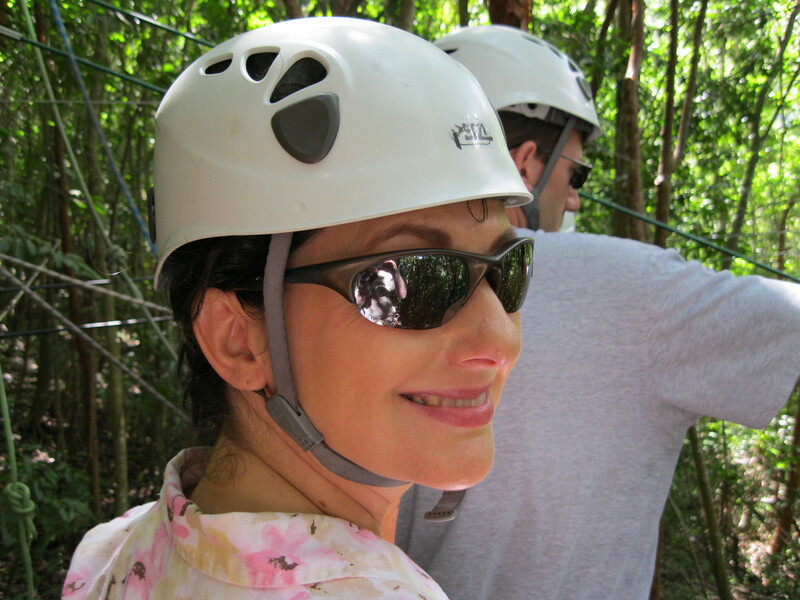 Other ways to reach are to visit new places, try new experiences (I recently tried Zip Lining and loved it! ), or talk to new people, even if it’s just standing in the checkout line in the grocery store. I would love to hear some of the ways that you reach and seek out new things, people, and experiences to enjoy. How does this enhance your life and help you be the best possible version of you? This entry was posted in MindBodySpirt and tagged albert einstein, Anabolic, Appreciation, Beliefs, comfortable, curious, desire, Enjoy, Experiences, extreme, feeling, Focus, forward momentum, Ideas, Inspiration, Law of Attraction, Love, Mind Body Spirit, people, physical energy, Pinterest, point of life, Positive Thoughts, Source, source energy, Spirituality, step dad, voyage of discovery, zip lining by Goss Coaching. Bookmark the permalink. This is a great blog Hanna and so timely. You know my challenges so when I went to NYC this weekend to see Lynnie’s ballroom dance comp, it was amazing. I wrote this in my gratitude list for accountability: Gratitudes 1. Beautiful dazzling breathtaking Ginger-Rogers Princess Cowgirl LYNNIE! 2. Gorgeous, warm, loving, smart, compassionate, funny adorable LYNDA! 3. A beautiful day in NYC with these two amazing women and our men. It felt like I’d stepped into someone else’s fairytale life and I was playing a part. But it was real and the joy was almost too much to contain. 4. Standing in Times Square, walking through NYC, being in a crowded competition, being at Penn Station in a literal wall-to-wall human traffic jam and not feeling any panic. NOT ANY. Not a wisp of it. I’m crying with joy writing this. I am cured. I am cured!!!! Wow, wow, wow! Congratulations. That is huge! Sounds like an incredible weekend and experience, and all I hear is gratitude and freedom! Thanks so much for sharing! I LOVE Pinterest. I have to limit myself because I could spend so much time on it. So glad you are enjoying it! Hope you have a beautiful day, too! Hugs! We all get like this. Stuck in our comfort zones. I think that’s why God invented spring – to get us out and about and moving ahead. Very true! Thanks for commenting!